Ripped off by baby boomers? 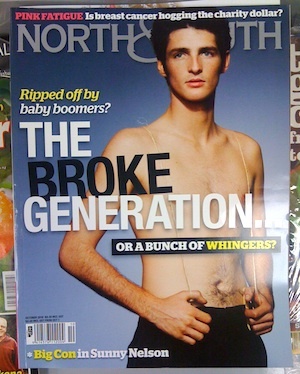 / The Broke Generation / or a bunch of wingers? Now, I know any defence of ‘existing privilege’ makes the defender — by definition — a Conservative — a Tory. I know that. It’s not how I see myself, but if you do, well, I guess I’m fair game. But the argument that Bernard proffers in ‘Leave ASAP’ i.e. … misses a few points, in my view, is redolent of something akin to schadenfreude, and even approaches wishing a pox on the houses of the baby-boomers. Here’s why. (1) Is it stoopid of me to say that earlier generations also struggled financially and (shock, horror!) went without to save up for their first house? I recall the saving programme (remember those? And not just for your trip to Noosa?) my wife and I undertook to accumulate $30,000 deposit to buy our first little house at $175,000. (OK, the numbers are going to sound kookie, these days, but what the hell). I think I was earning about $50,000 pa which, after tax was $35,000 — in those days it took us three years and some self-discipline to save that $30,000. (2) Does it mark me out as an out-of-touch curmudgeon (careful how you answer!) to say I observe a lot of young people seem to want to start on the property ladder a fair way up? Gee, maybe it’s THAT devil may care consumerist behaviour that is pushing home ownership out of their reach … and not some mythical greedy baby boomer intergenerational ‘conspiracy’. (3) Some are doing it. I met a young couple (early 20s) at an engagement party recently and was shocked — horrified, actually — at the amount of their mortgage. (Yeah, I asked them. Nosey? Who me?) It is astronomical, but that couple told me they wanted to live in a desirable suburb near the inner city, and not in a ticky-tacky box in a far-off ‘nappy valley’, (to use Olly Newland’s phrase)… and they were prepared to pay in the short term. This was an above-average earning couple, to be sure, and with their heads screwed on. And they were pretty confident, well, reasonably confident based on history, that if the debt got unmanageable or if ‘they’ got pregnant, they could sell their desirable, leafy-suburb house for something like its (fairly stable) value. But let me tell you, with the amount they were paying in mortgage repayments, there’s no doubt in my mind that this plucky, optimistic couple are already ‘doing without’ in a pretty significant way, and not wasting money … more strength to them. Surprise! Not everyone believes the wailing refrain of the oh-my-god-things-will-never-be-the-same-again-after-the-credit-crunch-global-financial-crisis-worldwide-recession brigade. Some people think there’ll be a blowout of some sort, and even a long recession, but not ‘financial armageddon’ … and that investments in property still look like a good bet, as they have done for (ahem) previous generations. It’s time for me to recant and to say what I’ve been thinking for months: the economic god of completely free markets and capital flows is not worth believing in anymore and we must look for other things to believe in and do. It’s a slippery slope. Take away the pension – and immediately the broke generation will end up spending all their time, money and energy looking after their parents and grandparents. So, broke as they are today – as broke as they will be tomorrow. Definitely agree with Hickey here. The problem though I think, is a sense of place. We as New Zealanders have forgotten who we are. By this I mean that we continue to think of ourselves as something we are not. This perhaps sounds negative – I don’t mean it to be. I really think we should focus on those things we do best. We are an agrarian based culture (and I see nothing wrong with that). We have definitely strayed from that path over the last forty years. We have some manufacturing but it is mostly local in nature. So why is it we think we should be bankers and wheeler-dealers of financial markets? I’m speaking here of our politicians – because they are the last people who should think that; but do. Yeah, JT, I don’t agree with everything Bernard says (so?) but he’s not wrong about everything. You know, I think some of NZ’s pursuit of economic purity/lowering trade barriers/opening ourselves up to foreign investment (plunder) has roots in an attempt to prove ourselves ‘worthy’ of still being allowed to sell our agricultural-based exports to Britain and the (then) EEC, now EU. We wanted to show we were pure — purer than our target markets. As is commonly asked now about Chinese attempts to buy a whole vertical market/export foodchain (i.e. from bulk farms to dairy factory to packaging to distribution — a NZ export product owned from grass to tetrapak by Chinese interests) … you try (as a Kiwi) rocking up to buy thousands of hectares of China and see how you get on. They’re not that stupid. We, it seems, because of our lack of ‘savings’ are. Flea on the tail of the dog, but doesn’t mean we have to sell out, does it? As for your other point about the ‘burden’ of the older generations, there is a fabulous BBC world service documentary series called ‘Return to White Horse Village’ by Carrie Gracie about the impoverishment of thousands of Chinese farmers whose ‘one child’ is burdened with their care…. Policy chickens coming home to roost.